My Nana (you know her – potato soup, spaghetti sauce, and gingersnaps, to name a few) has a few stories that I’ve heard her tell lots of times, but they never get old. One of them is the tale of ordering BLTs at a restaurant. She and her lunch companions asked for the bacon to be extra crispy, and when the BLTs came out, they were perfect. They thanked the waitress and told her the bacon had come out just right, so crisp – and she replied, “Oh, yeah, I just told the kitchen to kill it.” Then Nana makes a little mock-miffed face, like, hmph! Well! And then she chuckles her Nana chuckle. And I just love it. And that’s how I like my bacon, too. Kill it. It’s extra quick if you already have a stash of cooked bacon in your fridge, but even if you need to cook the bacon, it’s still a faster than fast food meal! There’s only the grilled cheese pan to clean if you do the foil right when you roast the bacon in the oven, and I recommend that you grill the sandwiches while the bacon is cooking and add the bacon at the end. This helps the cheese melt nicely in the grilled cheese, and keeps the bacon crisp. I usually serve some raw crunchy vegetables and fruit alongside these gooey, crispy, salty sandwiches but I also love tomato soup as a side (I always have a kind from Trader Joe’s on hand). 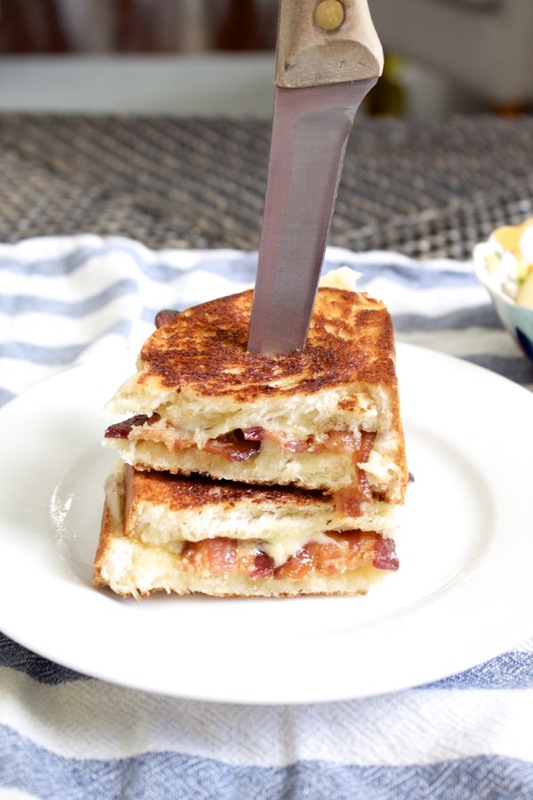 Next time you need a quick meal, go for bacon grilled cheese! Start warming a nonstick pan on the stove over slightly-below-medium heat while you prepare the sandwich ingredients. Spread the butter on one side of each slice of bread, and add the cheese between the slices (butter on the outside). Cook the sandwich for a few minutes on each side, until medium-brown and toasty and the cheese is melted. 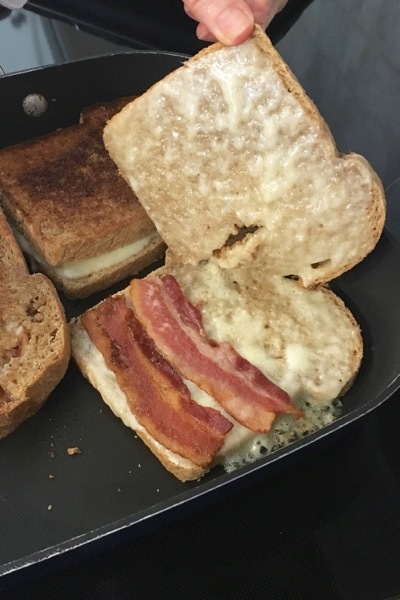 If the sandwich is getting too brown before the cheese melts, turn down the heat and turn the sandwich more often (you can also cheat and microwave it for 10-20 seconds, then put it back in the pan to recrisp). Once the cheese is melted, add the bacon and serve. 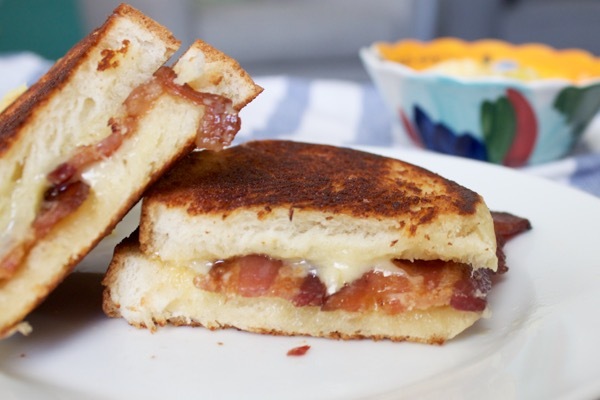 If you’re making the bacon the same day as the sandwich, start cooking the grilled cheese when the bacon is almost done. If you’re using leftover bacon, reheat it on a piece of foil in the toaster oven on the toast setting.